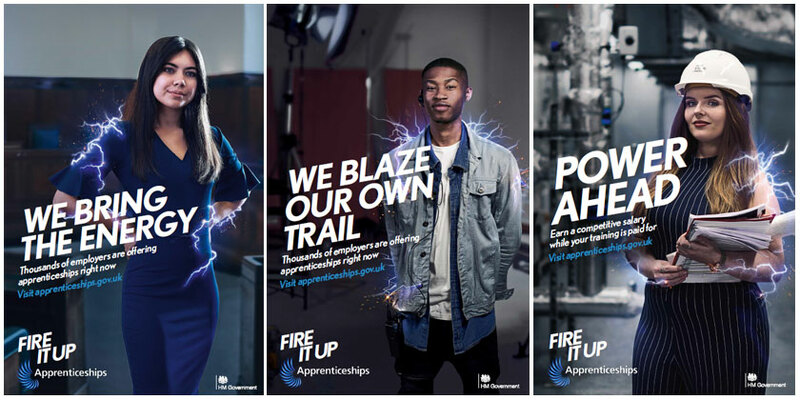 A new government campaign that aims to “shift deeply held views” on apprenticeships has been launched today. “We are seeing the apprenticeship system in this country come of age, with leading employers waking up to the benefits apprenticeships can bring,” said education secretary Damian Hinds. “Outdated and snobby attitudes” were are “still putting people off apprenticeships” – meaning they’re “missing out on great jobs and higher salaries. “Young people like me are thinking about their options,” said Alim Jalloh, a former social media apprentice with Channel 4, and one of the stars of the campaign. University “wasn’t for me” because “I didn’t feel it was preparing me for the job I really wanted”, he added. Today’s announcement cited a number of benefits to doing an apprenticeship, including access to “high-quality training” and the “range of exciting career options” on offer – including aerospace engineering, nuclear science, teaching, nursing, digital marketing, fashion and law. It quoted figures, first published by the Department for Education in December, that showed the amount of time that apprentices are spending in off-the-job training has increased – from an average of 560 in 2016/17, to 700 in 2017/18. The announcement also highlighted a range of evidence that it said was “proof” that employers and young people were starting to see the benefits of apprenticeships. These included DfE outcomes data, learner and apprentice surveys, employer evaluations, and reports by the Sutton Trust. The campaign is also focusing on ensuring that young people are made aware of apprenticeships. Mr Hinds wants “parents, schools and colleges to make sure apprenticeships are being promoted alongside more traditional academic routes”, it said. The DfE also said today that skills minister Anne Milton will soon write to 10 large multi academy trusts who are flouting the Baker clause to “remind them of their legal duty”. If DfE really want to shift views in the right direction, they should make 2 policy changes. 1) Remove the AMW for 19+ learners. How can an opportunity REALLY be seen as credible when it pays such a derisory figure? 2) Insert a contract clause for providers requiring a minimum percentage of apprentices to progress from completion to sustained employment, thus removing the “fee fodder” approach of employing an apprentice for the minimum time allowed, then dropping them and replacing them with a new fee, err, I mean learner.